StopTech High Performance Street and Racing Brake Fluid is a DOT 4 motor vehicle brake fluid, engineered to optimize brake system performance at high operating temperatures. In addition to guarding against boiling and subsequent loss of efficiency at severe temperatures, StopTech Brake Fluid maintains its excellent viscosity, lubricity and non-compressibility. This High Performance Brake Fluid conforms to and exceeds the current specification of U.S. FMVSS 116 (ï¿½ 571.116) DOT 4, is road legal, and compatible with modern ABS and other vehicle dynamic control systems. StopTech High Performance brake fluid is mixable with all DOT 3 and 4 products but should not be used in vehicles with mineral oil systems. 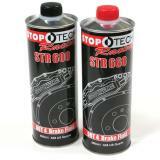 StopTech High Performance Street and Racing Brake Fluid maintains its excellent viscosity, lubricity and non-compressibility. 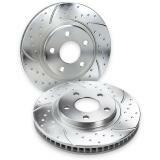 Engineered to optimize brake system performance at high operating temperatures. 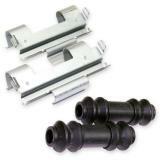 Guards against boiling and subsequent loss of efficiency at severe racing temperatures. 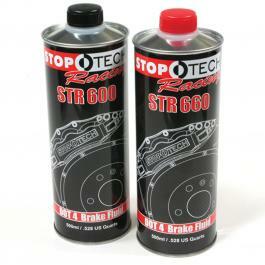 StopTech High Performance Brake Fluid that exceeds DOT 4 motor vehicle brake fluid Specifications. 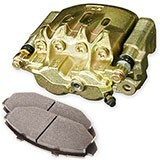 Mixes with Dot 3 and 4 Brake Fluids to eliminate flushing the brake system. Packaged in a special metal container that is not only functional but gives you 25% longer shelf life. StopTech High Performance Street and Racing Brake Fluids are designed for any vehicle requiring a high viscosity, high-lubricity and non-compressible brake fluid. Ideal for street and high-performance race use.